For Pennsylvania dairy farmers, producing feed grain on the farm requires less energy than importing it from the Midwest. ALSO: Sheep feedlot software available. For Pennsylvania dairy farmers, producing feed grain on the farm requires significantly less energy than importing it from the Midwest, according to Pennsylvania State University researchers whose findings may help dairy farmers save energy and money in the face of rising feed costs. Brian Gray, a former Penn State undergraduate research assistant, stands in a field of flowering canola at Penn State's Agronomy Research Farm in Rock Springs, Pa. 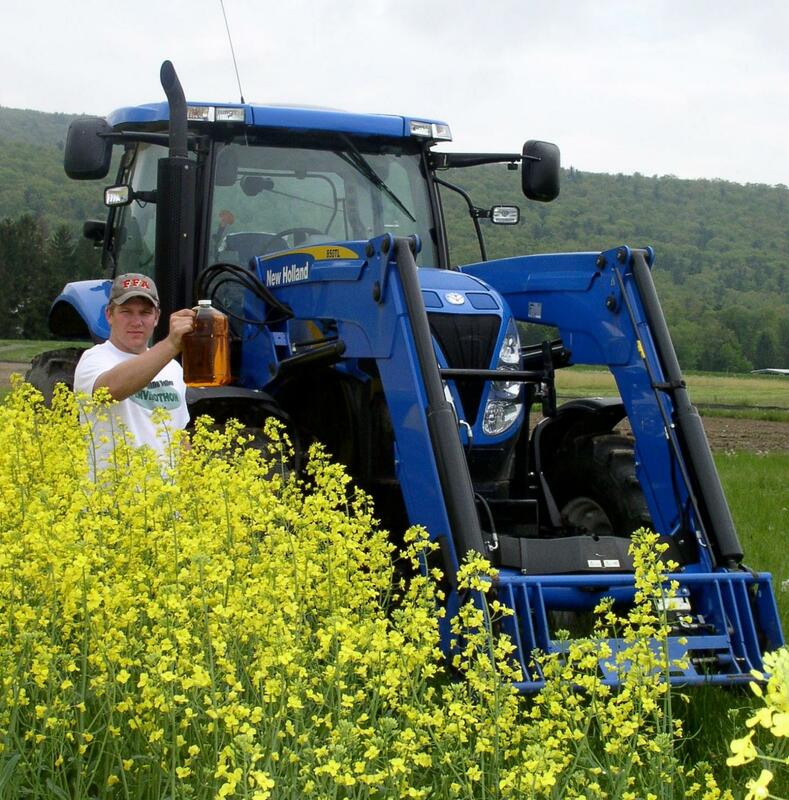 The canola oil he is holding was pressed and filtered at the farm to fuel a tractor that was designed to run on straight vegetable oil. Photo: Heather Karsten, Pennsylvania State University. Historically, it made economic sense for many dairy farmers in the Northeast to import feed from the Midwest, where yields are higher and subsidies contribute to a relatively cheap and abundant supply. However, this separation of cows — and their manure — from feed crop production results in a regional nutrient imbalance with important energy implications. Grain prices can also be volatile, with much higher costs in some years. "If you think about the midwestern practices for growing feed crops, largely it's done with synthetic nitrogen fertilizers, which are extremely energy-intensive to produce," said Glenna Malcolm, former research associate in plant sciences who is now a lecturer in biology at Penn State. "We wanted to understand the energy use that this approach requires compared to growing feed on farm, where that fertilizer requirement can be met, in part, with manure and through diversifying crop rotations to include perennial legume crops that convert atmospheric nitrogen to a usable form for plants." Malcolm and her colleagues compared the energy use of three farming systems. On the low-import end was a dairy cropping systems designed to meet the forage, feed and fuel needs of a 65-cow, 240-acre dairy farm. Computer models simulated the milk production based on actual crop yields and quality analyses. The researchers reported their results in a recent issue of Agriculture, Ecosystems & Environment. Using farm-scale equipment and manure from a neighboring dairy farm, the researchers grew feed grains — corn and soybeans — and forage crops — alfalfa, corn silage, rye silage, red clover and rye — on 12 acres, one-20th the size of a 240-acre farm. They also grew canola, which they processed into fuel for the farm's vegetable oil-powered tractor. They fed the canola meal byproduct to the virtual dairy herd. They imported some diesel fuel for custom farm operations, as well as some grain to make up for a slight shortage in their on-farm production. For comparison purposes, the researchers then simulated two additional farms that represent different Pennsylvania dairy farming approaches. Both simulated farms used the exact same rations for the same number of cows as the research farm's virtual dairy herd and, therefore, produced the same amount of milk. Both used diesel fuel for all tractor operations and were assumed to be practicing no-till agriculture. Both farms also used nitrogen from animal manure and alfalfa and so had lower nitrogen fertilizer needs than midwestern grain farms. However, even though the Pennsylvania farms achieved the same yields per acre, they differed in their size and how much feed they imported. One grew only forage crops on 120 acres and imported all of its feed grain. The other grew all of its forage crops and the majority of its feed, including corn grain and soybeans, on 160 acres. With this range of farms, the researchers quantified and compared how much fossil energy it took to produce the feed for the farms' cows. They used an open-source computer model, the "Farm Energy Analysis Tool," developed by then-master's degree student Gustavo Camargo. The researchers accounted for fertilizer, lime, seed, pesticides, on-farm diesel consumption, grain drying and off-farm diesel used to transport inputs to the farm and grains to an off-site storage facility. "When we looked at the results, our most notable observation is that the smallest Pennsylvania farm — the one producing only forage and importing everything else — has a large fossil energy input compared to the other two," Malcolm said. "Now, that's on a per-Pennsylvania-farm acre basis. When you consider the different sizes of the farms and adjust the results to a milk-produced basis, the difference is not as big, but you can still see that the two larger farms are using about 15% less fossil energy than the small farm to produce the same amount of milk." The largest source of fossil energy inputs for the small forage-only farm was the production and shipping of midwestern grain, followed by on-farm diesel and nitrogen fertilizer use. In fact, nitrogen inputs were four times greater for imported corn grain than for grain grown on the trial farm, where injected animal manure and nitrogen-fixing legumes were used to meet a significant portion of the crop's nitrogen requirements. Malcolm said while growing the canola fuel crop on farm may have other environmental benefits, it did not result in significant energy savings, considering trade-offs like the additional land required to grow canola and the energy required to press and process it. "In terms of energy use, the middle farm — which wasn't trying to grow fuel crops — is pretty similar to our farm, where we were growing a fuel crop," she said. "So, just growing your own feed on farm makes a big difference." In addition to revealing the energy savings that can come from growing more feed on farm, these findings can have important economic implications, said Heather Karsten, associate professor of crop production and director of the long-term cropping systems trial. "The reality is that, in some years, feed costs have gone up, especially in years with high fuel costs and demand for grains from the biofuel sector," she said. "One of the take-home messages from our study is that, in addition to saving energy, this strategy of growing more of your feed on farm can reduce off-farm nutrient imports and the economic risk of fluctuating feed costs." Other members of the Penn State research team include dairy extension specialist Virginia Ishler and professor of agricultural and biological engineering Thomas Richard. New software that will help sheep feedlot managers keep better track of their operations is now available from the Iowa Beef Center. Assistant scientist Garland Dahlke developed the software for sheep managers using the popular beef feedlot monitor software as a model. He said the program provides detailed monitoring of both animal performance and business transactions that are part of the sheep feeding enterprise. “This new software will provide sheep feedlot managers the same information cattle feedlots have to monitor their operation and stay efficient throughout the year,” Dahlke said. The software can use Excel to download or analyze data as well. Directions are provided in the free documentation. The software and documentation are available from the Iowa State University Extension & Outreach online store. The animal performance evaluation portion of the software is based on real-time feed consumption and financial information that can be tied to health data. This creates a basis for the estimation of current growth and subsequent performance. The business component includes a daily accounting of costs and income and provides the option to track feed and drug inventory. The user can then generate closeout statements for groups in the operation, as well as billing statements for custom feeding operations.